Arturo Fuente Curly Head Deluxe cigars represent the culmination of four generations of the cigar makers. With the many different lines and tobaccos used Arturo Fuente offers something for everyone. The Arturo Fuente brand was founded by Arturo Fuente in 1912 in Tampa, Florida. The brand closed production for 22 years after a fire destroyed their factory in1924. In 1946 Arturo Fuente went back to cigar production on the back porch of his home in Ybor City. The Cuban tobacco cigars were only available locally on a limited basis. In 1958 Arturo's son, Carlos took over the company by purchasing it for $1. 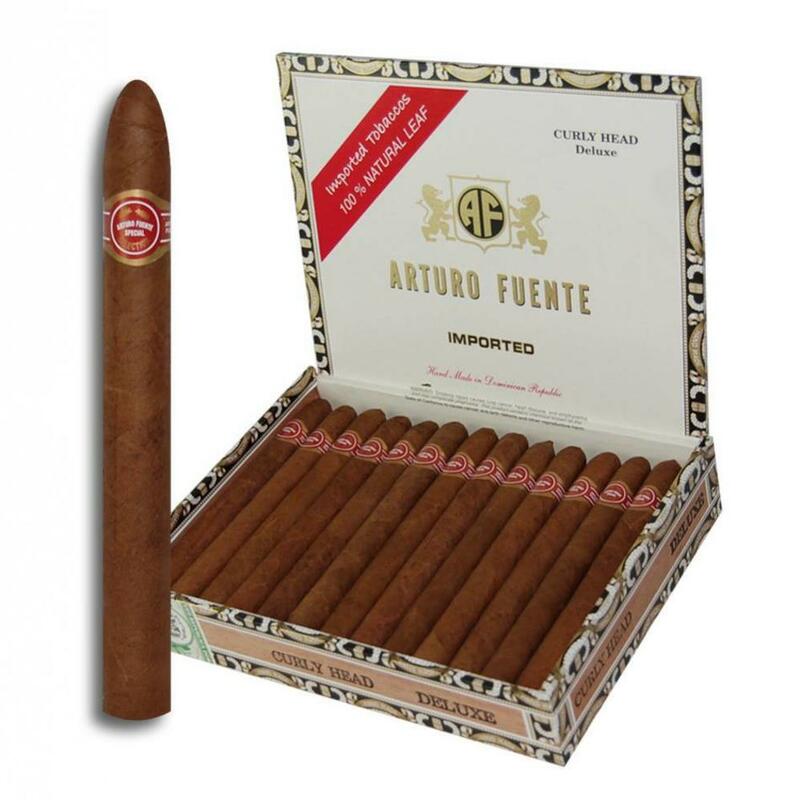 Due to the 1960 United States embargo on Cuba, the Fuente brand slowly prospered in the cigar business. Today Arturo Fuente is considered one of the most praised producers of hand-rolled premium cigars in the Dominican Republic. The Arturo Fuente Curly Head Deluxe Natural is a mild to medium bodied cigar. The premium yet affordable cigar must go through the same high standards of production that other Arturo Fuente do. The cigar is made from a variety of Dominican tobacco fillers and a rustic, medium brown Cameroon wrapper to provide a pleasant smoking experience. The Curly Head is smooth, mild and slightly sweet with a lot of nutty flavors. The mellow Curly Head Deluxe Natural pairs superbly with coffee. In 2007 the cigar company introduced an espresso blend of coffees to expertly pair with their cigars. The Arturo Fuente Coffee company’s Café Cubano is a blend of fine Arabica and Robusta coffee beans. Espresso lovers will appreciate the full-bodied dark roast. One crisp morning and needing a boost of energy, I took my Café Cubano double espresso and a Curly Head on my hike up steep Pocono mountain. With my aging knees, the two made the difficult trek almost tolerable.